After 11 years, the Winnipeg Jazz Orchestra has evolved into a mature, confident big band that swings like mad while reinventing and refreshing the American Songbook. The Winnipeg Jazz Orchestra (WJO) is the only community-based professional jazz orchestra in Canada; its equal can be found in only a handful of major U.S. cities. Dr. Richard Gillis and Sasha Boychouk founded the WJO in 1997, inspired by a vision of forming a professional big band with the best emerging and veteran musicians in Winnipeg. Today, the orchestra roster boasts 18 to 25 musicians whose combined resumes touch every corner of performance jazz locally, nationally, and around the world. 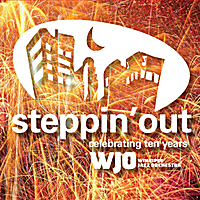 With the release of their second CD, Steppin\' Out, the Winnipeg Jazz Orchestra tackles the Great American Songbook. “Throughout the CD the playing is tight, agile and full of energy…after 11 years the WJO shows no signs of slowing down and, as this recording proves, they have matured into a solid and confident big band - 4 stars” (Michael Wolch, Winnipeg Free Press).